STEM stands for science, technology, engineering and mathematics - four exciting disciplines that will shape the future. At Olympian City, they believe that when you open the young generation’s minds to STEM, you can help them create a brighter future and change the world for the better. Bring your young geniuses to explore endless possibilities at STEM Lab. Through facilities and workshops, STEM Lab help your children develop an interest in sciences. 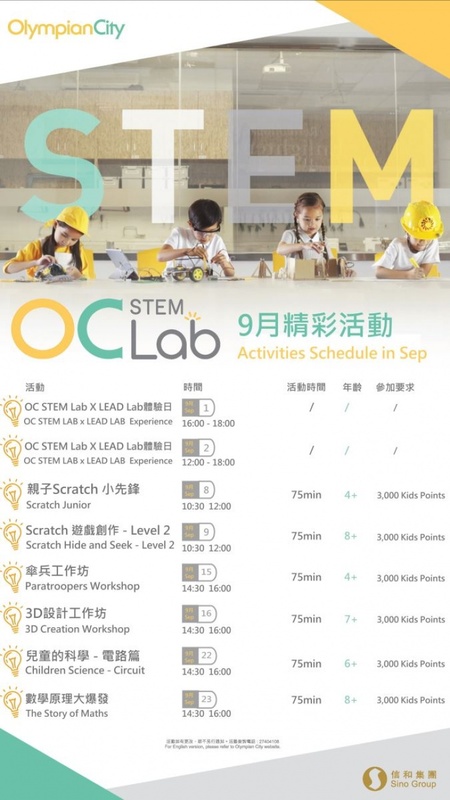 STEM Lab are pleased to offer workshops and activities that help kids learn about coding, robotics, maker culture, virtual reality and augmented reality. Professor Einstein AI Robot - The Professor makes his first appearance in a Hong Kong shopping centre! This interactive robot inspires imagination, starts conversations and brings Einstein’s humour and vast knowledge back to life—helping kids develop a passion for science.